Are you lonesome tonight, is your kitchen a sight? 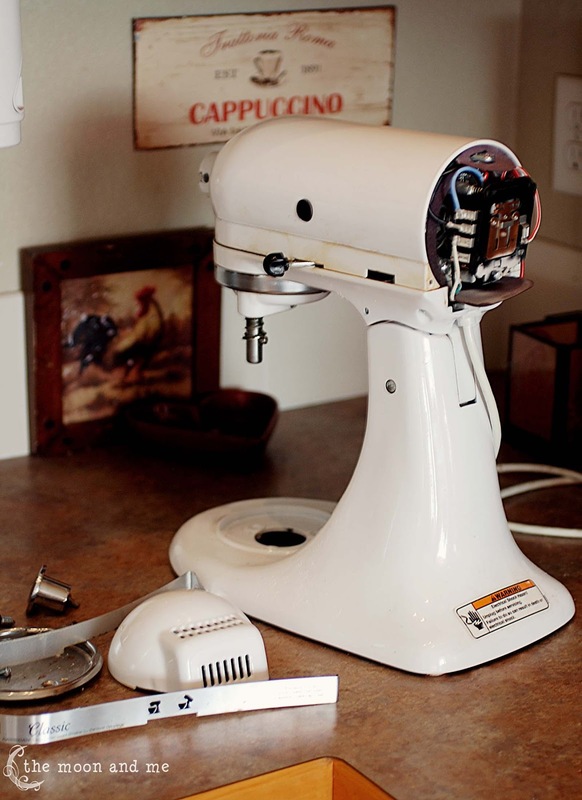 Or if not your kitchen, your KitchenAid? shell out the moolah for a new one. to help with it's appearance...it didn't do much. And it was a PAIN to get it off! But, once that was taken care of, I took of the parts that would detach. 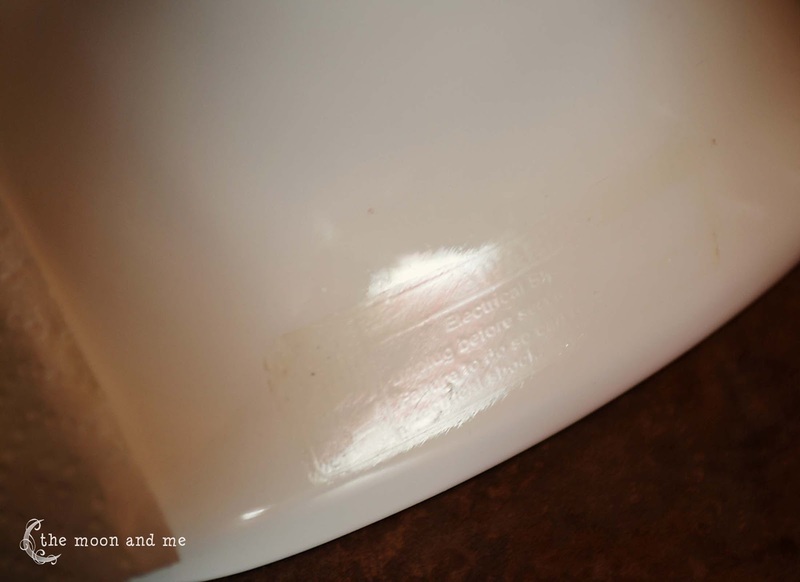 The bowl holder, the back cover and the silver band. Clean the heck out of it. I hadn't realized just how dirty this baby was. I would wipe it down but there was gunk in all the crevices. I must have spilled vanilla on it once or twice...it was all sticky behind the band. And then...I think it was cleaner than when I got it! Then take the sticker off the back. I used a widget thingy. But I still couldn't get it all. See here? The words are still there in some magical "forever" glue. 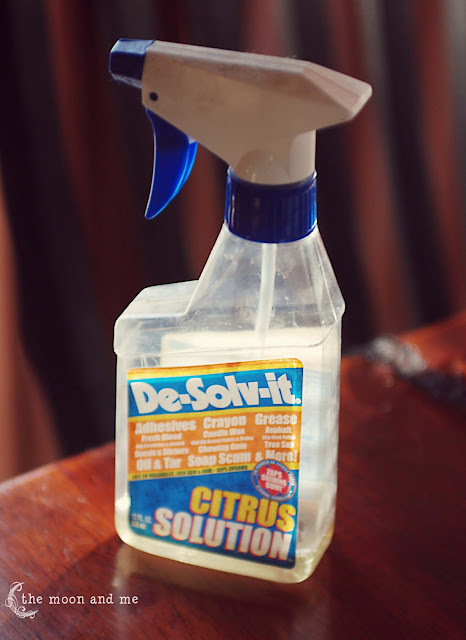 I had to break out the big guns to get that goo off! Then I just wiped that area off again with the Krud Kutter. I lightly sanded all over where I would paint. Just use a sponge sander. 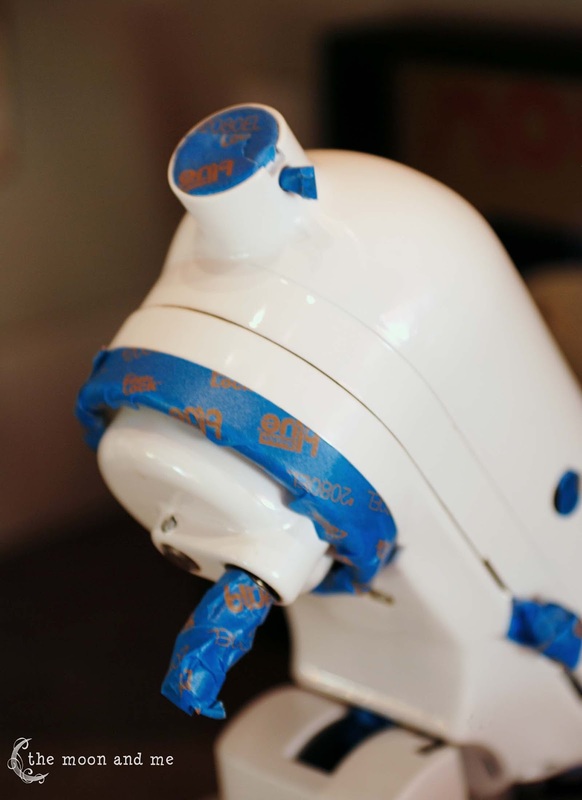 Use some painter's tape to cover up all the parts that should NOT be painted. 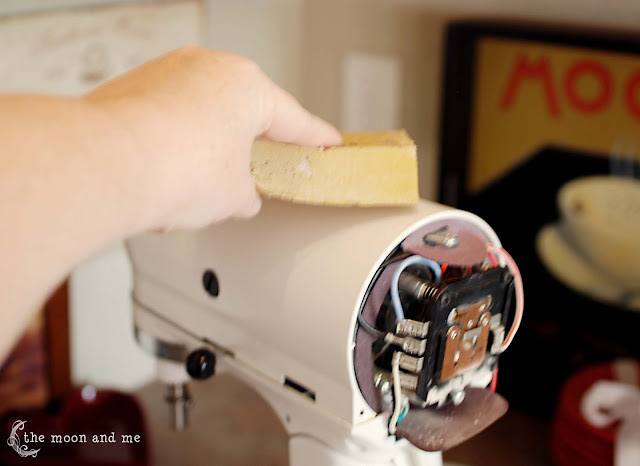 I used a zipper baggie over the motor and tape to secure it. Make sure you get that little accessory hole on the front! She was so pretty after that first coat of black...I almost left it like this. Major curses and grumbles ensued. After the black...I used some vinyl circles I mentioned here. and STILL didn't get them perfect! and the spray paint made the vinyl super soft. It was a nightmare to take off. So I had to do some touch up. Even with the grumbles...I am glad I went ahead with the dots. but it wouldn't have the same character. 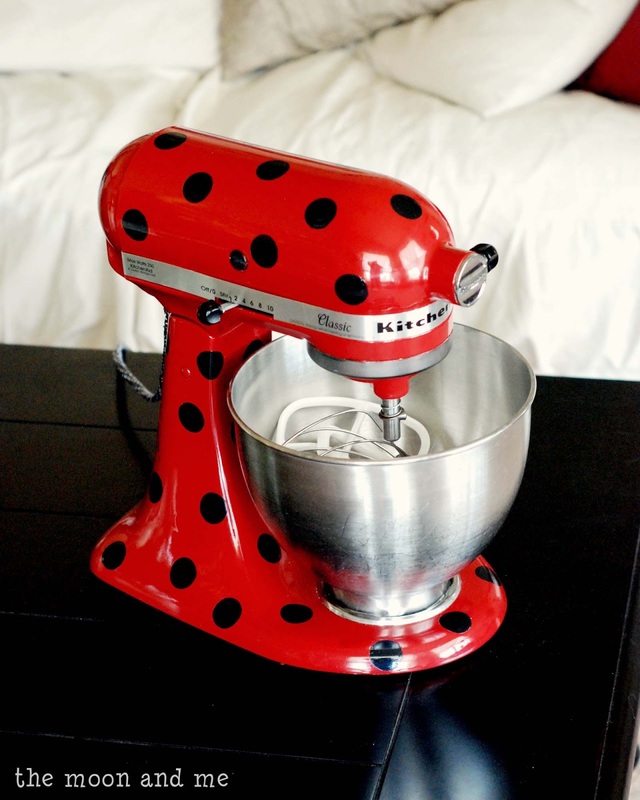 I am SOOOO in love with this mixer. and it might just be "the one." 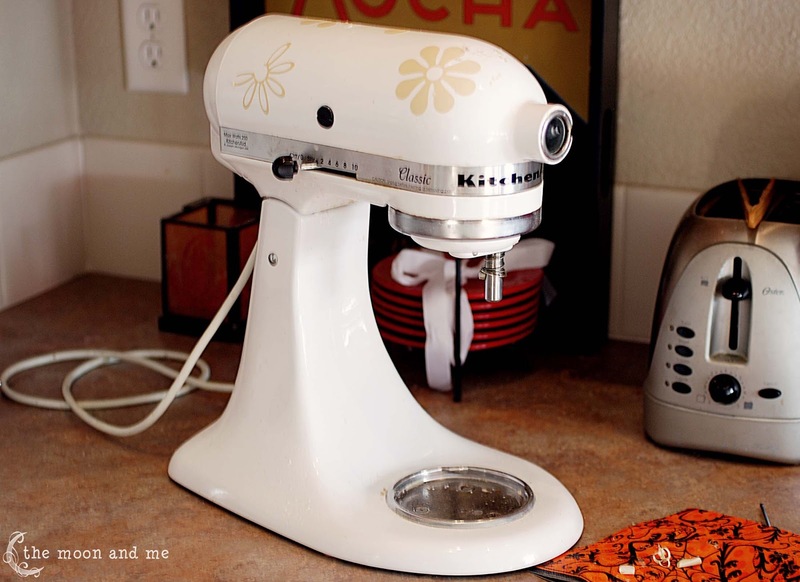 what would your mixer look like? It is a great make-over. I love the red and black, very cute! 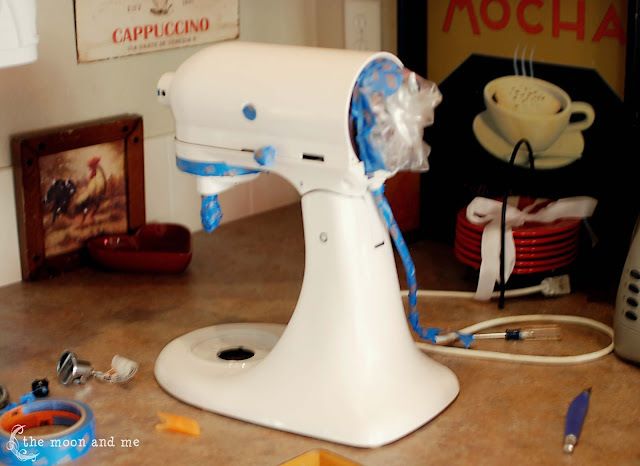 I just got my stand mixer for Christmas last year, and I don't think I would have the guts to paint it. Mine is also the red one, and I love the lady bug dots on yours! But I'm too chicken to spray paint it... 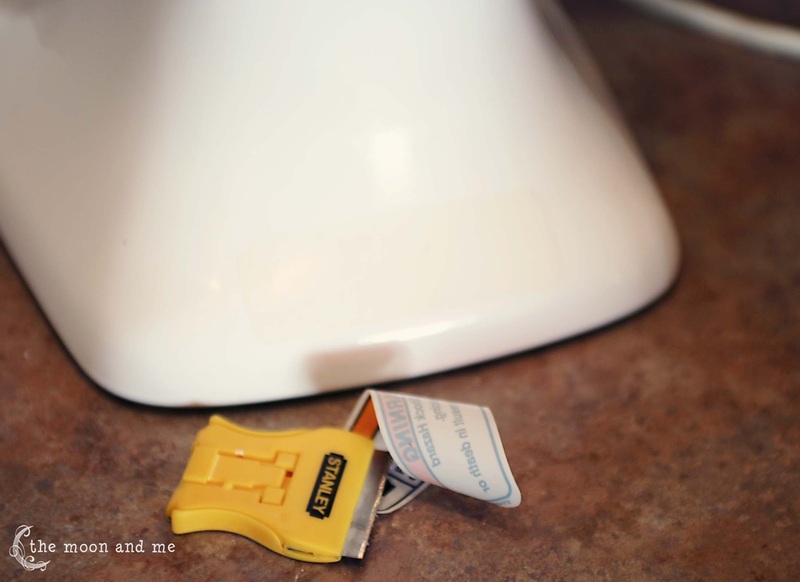 I'd mess it up and then never forgive myself, then feel guilty every time I used it. LOL. I agree with Diana's comment above - you should start a stand mixer re-do business! Yours looks simply amazing! And... I'm your newest follower! 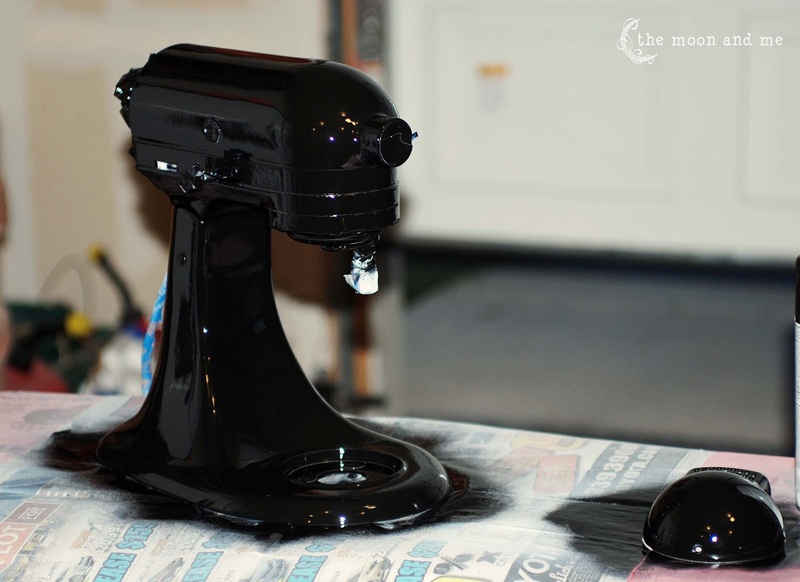 Some people have custom paint jobs on their cars... you have a fabulous custom painted mixer! What an original!!!! You were very brave to take it apart! 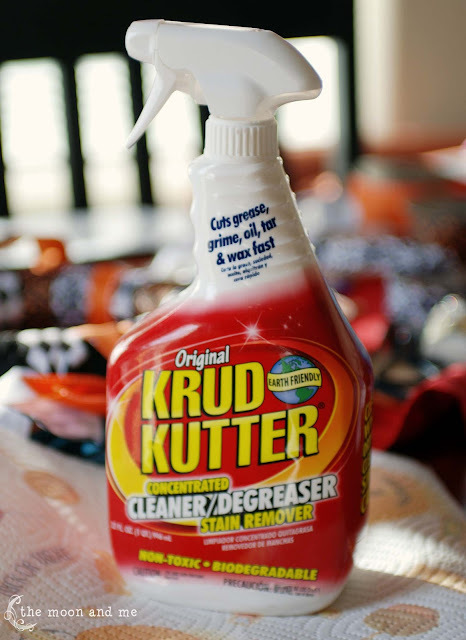 Thanks for the tips about the Krud Kutter and Desolve It! Fabulous work! Love the polka dots one!Thanks so much for sharing the great tutorial! I'd love for you to visit my blog. It's adorable in spite of your troubles Kelly. Thanks for sharing. OK this is AWESOME. What a great idea! For some reason I never thought of doing this. 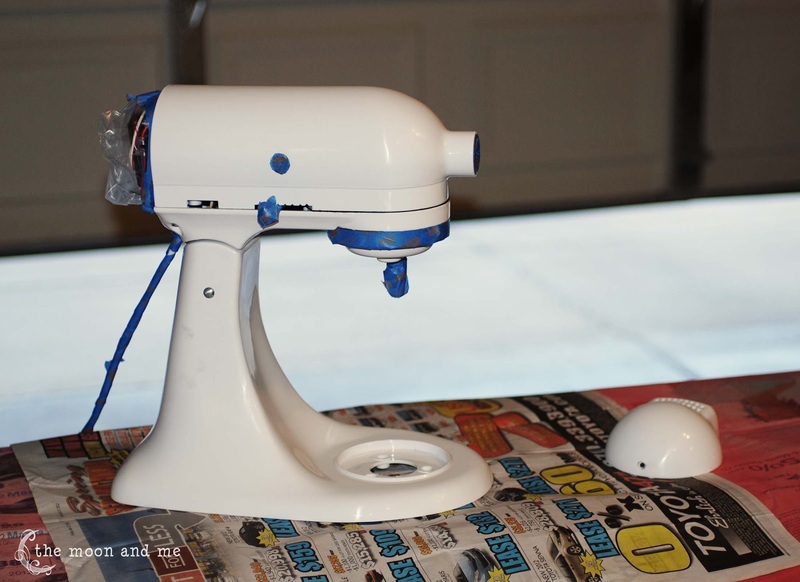 I'm going to have to make big plans for my mixer, LOL. Oh my gosh, this transformation is AMAZING!! You did a wonderful job on it! 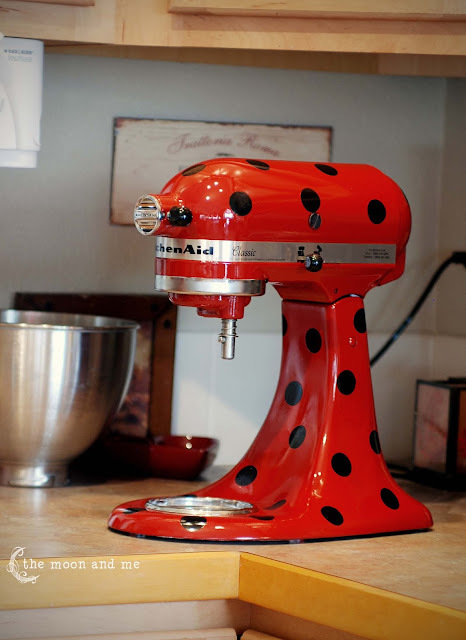 I love the red with black dots! Thanks for linking up to Thrifty Thursday! 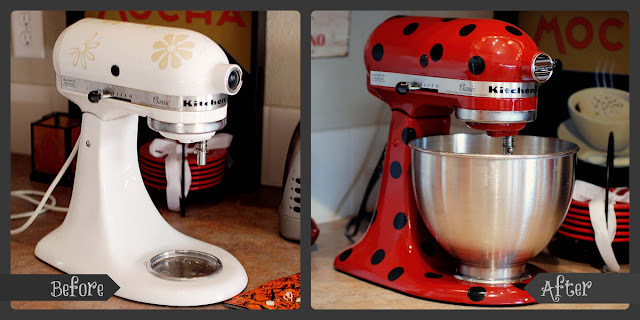 Kelly, I love your mixer transformation. It looks amazing and brand new. Great job!! What a great idea! I've wanting a new one also, but don't want to spend the money when I have one that works fine. Thanks for the idea. Found you through Serenity Saturday! 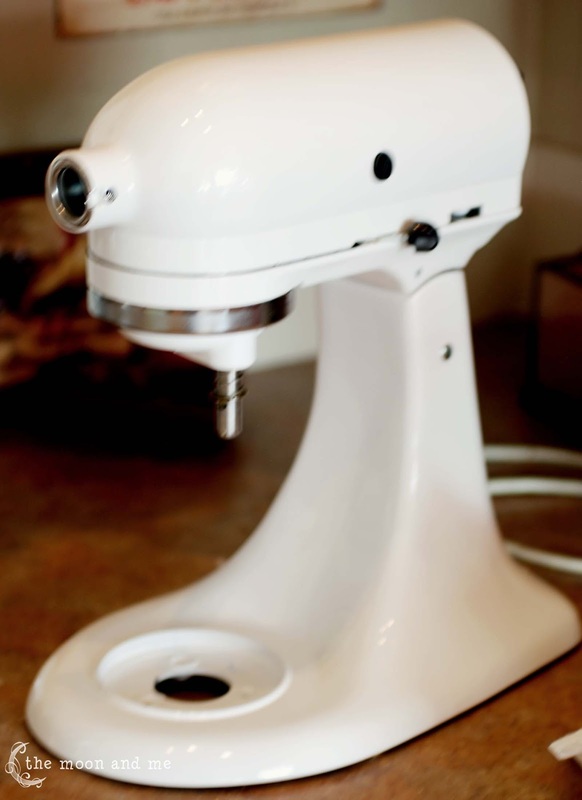 Any suggestions for a glue/adhesive to add Swarovski crystals to my stand mixer??? I just got a pink Artisan for my birthday and am determined to bling it out! I tried my trusty E6000 glue...it's not working...peels right off. Any suggestions?? 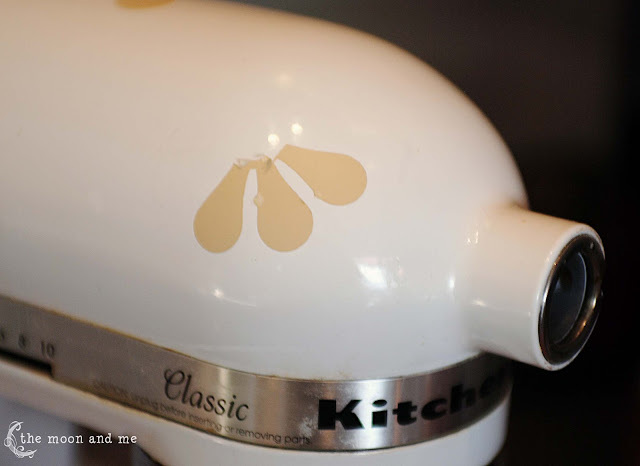 This is great idea for some reason.This is really helpful for kitchen and it's one of the best kitchenaid product. Hi, Kelly, You are a Great!! What a awesome idea you share with all us. 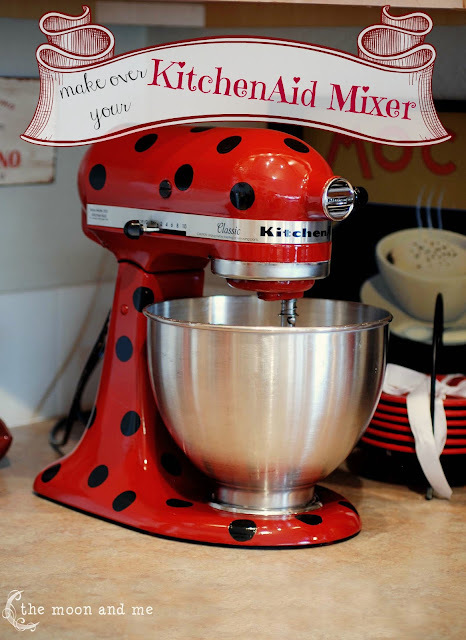 I am surprised to know that how to change a color of KitchenAid Mixer.Thank you so much. 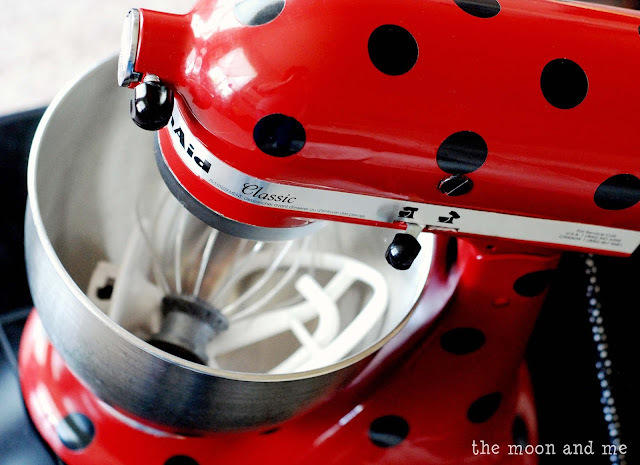 Love the idea of painting your KitchenAid Mixer. I keep mine in the garage as it is "urine yellow"! Not even a happy shade of yellow! I would like to try your idea of paining it but wonder what type of spray paint you used on your appliance. Again, thanks for the tip!